Trail mix – with cranberries, almonds, peanuts, pumpkin seeds, coconut, flax seeds and gluten free oats. Nice flavour and decent texture, but a little dry in my opinion. Dark Choc Chip – my preference of the two, the Fair Trade dark chocolate bits give a nice cool contrast to the rest of the bar, but I’d argue it could do with a few more choc chips. 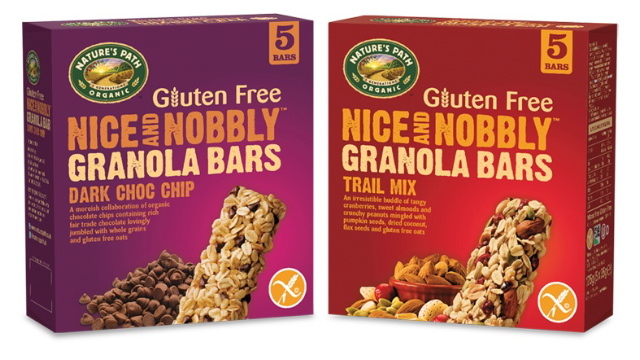 Both great products and great to keep in your office drawer, your bag or kitchen cupboard for on-the-go snacks. I’d say they could do with being a little less dry, maybe more chunks, but they definitely meet a need that isn’t really being met at the moment. Packs of five 35mg bars available from Sainsbury’s, Tesco.com, Waitrose and all good independent food stores (probably not many then), priced £2.99 (RRP).